· Magneti Marelli will be taking part in two conventions in the “Motor Show Incontra” programme. On the 3rd of December, “Innovazione: dalla pista alla strada” (“Innovation: from the track to the road”), on the 5th of December “Le sfide tecnologiche dell’auto e la loro sostenibilità economica” (“The technological challenges of cars and their economic sustainability”). · On the 4th of December, Magneti Marelli Checkstar will be the protagonist in the first “Grand Prix del Network e degli Autoriparatori” (“Grand Prix of the Network and car repair workshops”. For 2016 edition of the Bologna Motor Show - taking place from the 3rd to the 11th of December - Magneti Marelli will be actively present in Pavilion 26 (stand B44), with an exposition area of 130 square metres which represents the best of the company’s technology. The theme “Tech & Racing Experience” is organized in four areas dedicated to products created for racing and road-going cars, to the aftermarket, to the world of social networks and to interaction with the general public through telemetry games. In the area dedicated to products and technology, visitors will have the opportunity to learn about systems created by Magneti Marelli for the most important international motor competitions and for road-going vehicles via an information itinerary which will involve the visitor in a veritable “Tech & Racing” Experience. Magneti Marelli technology from the fields of communication, connectivity and Human-Machine Interface will be presented, as well as lighting, powertrain and sound design, with a balanced division between motorsport and road-going vehicles. The experience will begin with innovation dedicated to the improvement of safety in competitions: Magneti Marelli Motorsport’s High Speed Camera. The micro telecamera adopted this year by all Formula 1 cars represents an important example of an application studied to improve the safety of drivers, which was recently awarded at the Professional MotorSport World Expo 2016 in the category “Motorsport Technology of the year”. It is an example of avant-garde technology developed in collaboration with the Global Institute for Motor Sport Safety and Sustainability of the FIA (Fédération Internationale de l'Automobile). The stand will also present solutions linked to the improvement and optimisation of internal combustion engines, such as, for example, high pressure GDI injectors for competition (500 bar) and for road vehicles (600 bar). There will be focus on management and the two-way transmission technology of important information between cars and infrastructure, managed on the racetrack via telemetry and on the road via telematics. There will also be innovative examples of instrument clusters such as those adopted for the new Peugeot 3008 and the Porsche 911 GT3, as well as racing dashboards. Road safety and design come together with top performance technology in adaptive Full-LED lighting systems chosen by BMW for the 7 Series and by Mercedes-Benz for the AMG GT, and in the laser full-beam headlight module for the Audi R8. The experience regarding the development of hybrid-electric technology matured in competitions also finds applications in Formula 1 with K-ERS and H-ERS, and in Formula E, where Magneti Marelli is present this season with electric motors and inverters. This is technology which, simplified and combined with AMT (Automatic Manual Transmission), can also be applied to road vehicles thanks to the PERF.E.T. (PERForming and Efficient Transmission) hybrid-electric transmission system, the ideal synthesis of the process of technology transfer between the worlds of “racing” and the “road”. Continuing within the exposition space, visitors will be able to explore the many opportunities that enthusiasts have to follow the activities of Magneti Marelli on Social Networks. The “social wall” will display, in real time, posts loaded on the official profiles of Magneti Marelli present on Facebook, Twitter and Instagram. Furthermore, everyone can be a protagonist on the “social wall” thanks to the selfies taken within the stand and shared using #MagnetiMarelli. Visitors will also be able to put their abilities to the test by playing “Team2Win - the telemetry game”, a collaboration game played in couples on the functioning of telemetry. Through the use of telemetry, the player who takes the role of “box manager” will communicate with his/hers team companion in the role of “driver”, indicating a series of “boosts” to be collected along the track. The final score will be defined according to various parameters such as reaction speed, timing and the number of errors made during the trial. The area dedicated to the aftermarket world will present many initiatives from Magneti Marelli Checkstar, beginning with participation in the first “Grand Prix del Network e degli Autoriparatori” which will take place on Sunday 4th of December in Pavilion 31 and will see the participation of a number of the most important Italian networks and eight of their best workshops in a series of challenges (diagnosis, mechanics and on-track tests). 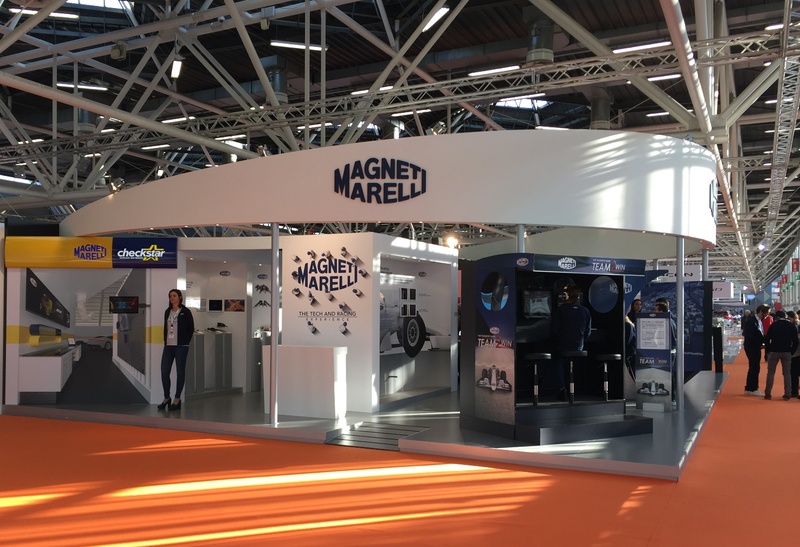 An idea of what the workshop of the future will be like is examined again in Pavilion 31 (stand B27) where the Magneti Marelli Checkstar stand will represent the cutting edge in customer service and the innovative heart of the network. Magneti Marelli’s role as an important interlocutor in the automotive and competition world will be underlined during the convention “Innovation: from the racetrack to the road” which will take place on the 3rd December, at 3 pm, in Conference area 1. During the event, Roberto Dalla, Head of Magneti Marelli Motorsport, will speak about the role of Magneti Marelli in the growth of technology in the automotive sector due to the exchange of know-how between competition and mass-production. Finally, on Monday 5th of December at 3 pm in Conference area 1, Giovanni Gaviani, vice president for Business Development for Magneti Marelli Powertrain, will be taking part in the debate on the theme of “The technological challenges of cars and their economic sustainability”. Magneti Marelli designs and produces advanced systems and components for the automotive industry. With 89 production units, 12 R&D Centres and 30 Application Centres in 19 countries, approximately 40,500 employees and a turnover of 7.3 billion Euro in 2015, the Group supplies all the most important car makers in Europe, North and South America and Asia. Business areas include Electronic Systems, Lighting, Powertrain, Suspensions Systems and Shock Absorbers, Exhaust Systems, Aftermarket Parts & Services, Plastic Components and Modules, and Motorsport. Magneti Marelli is part of FCA.